Butternut squash here, acorn squash there, squashes everywhere! Though it does not quite feel like autumn here in sunny southern California, the season is certainly upon us and along with the chill we hope will soon follow are the fruits of farming labor - hardy, root vegetables. True Food Kitchen at Fashion Island in Newport Beach has embraced this change in produce and recently launched their fall menu that falls in line with their focus on health-conscious food. What does that mean? 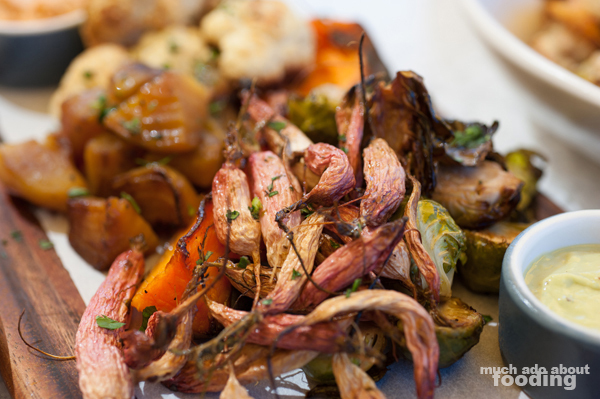 Roasted root vegetables galore! However, it's not just the entrees that have gotten a little switch - this seasonal change has moved in options on all parts of the menu. We were invited in to try out some of the new dishes which are available through mid-December. 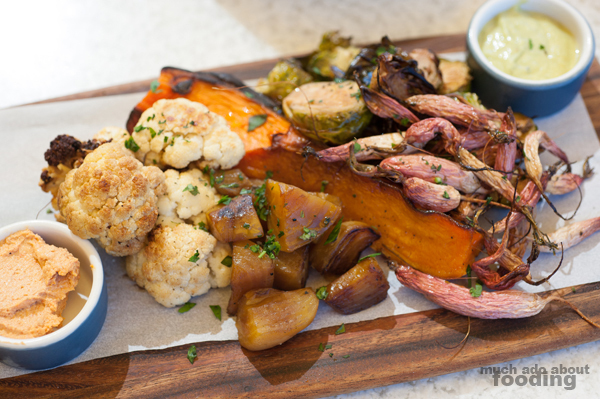 Some outstanding favorites: the Roasted Seasonal Vegetable Board and the Butternut Squash Pizza. Not everything on this year's fall menu is brand new to the restaurant group though - seasonal favorites have made their return since they started serving the autumnal dishes in mid-September. We began with the variety of their drink additions. 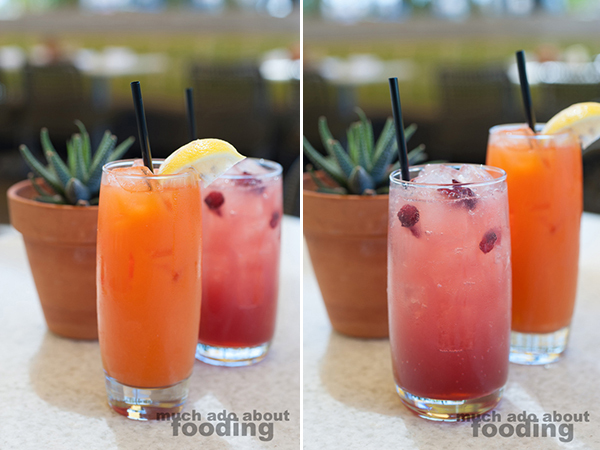 Now, if you have not yet indulged in True Food Kitchen's drinks, you are missing out. Made fresh and to order using fruits and vegetables at their peaks, the libations never disappoint. The change in menu items was an opportunity to move around some selections. We went with the Honey Bee Ginger Beer ($5.50 - ginger honey, chai spice, lime juice, and sparkling water), cold Matcha Horchata ($6 - matcha, almond milk, evaporated cane, cinnamon, clove, and vanilla), Carrot Lemonade ($4.5 - carrot, ginger, honey, and lemon), and Autumn Spiced Sparkling Tea ($4 - cranberry, lime, and cane sugar). Of the four, we were very partial to the first two but all were very thirst-quenching and fantastic in their own right. 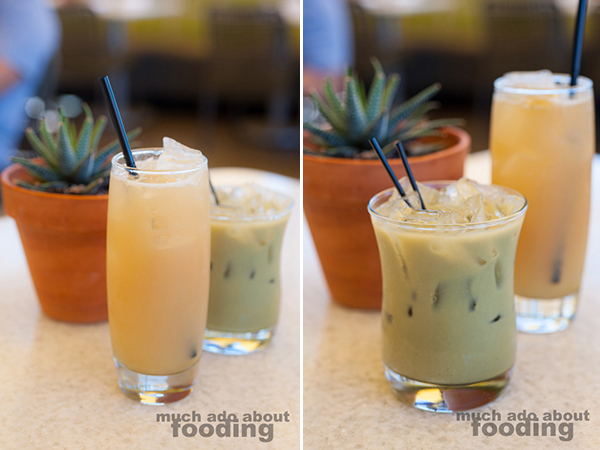 The ginger beer drink had a lovely dimension to it from the chai spice which accentuated the root's spiciness, and the horchata interpretation with matcha made for a creamy but light drink. I could see how it would be great hot or cold. The carrot lemonade was quick to get through because of the perfect balance between sweet and sour, and the sparkling tea smelled perfectly like autumn with some carbonated buzz. The one new menu item we didn't actually try was their Sparkling Apple Soda so you'll have to tell us how that one goes! To follow after, we had a bowl of their Daily Market Soup ($7) which happened to be butternut squash that day. A little dollop of pesto in the center cut through the potentially heavy puree and brought a vegetal brightness to the creamy soup. There was no problem whatsoever lapping up every bit of this bowl. What used to turn people's heads at True Food Kitchen was the Chef's Board but because it was laden with meats and cheeses. Instead, this season, greens have become the centerpiece and would you believe that it still turns heads? 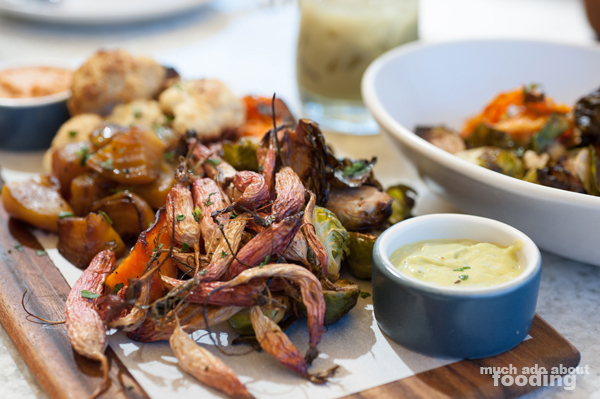 Their Roasted Seasonal Vegetable Board ($14 - with avocado green goddess dip and pimento cashew cheese) featured its fair share of ripe vegetables. Ours that day had cauliflower, golden beets, butternut squash, brussels sprouts, and turnips - all roasted to perfection. What really made this board come together well was the inclusion of the two dips which gave each vegetable a different taste profile when added on. We liked each for different reasons but I highly suggest sticking your cauliflower with some cashew cheese spread and the turnips with the avocado dip. Trust me. 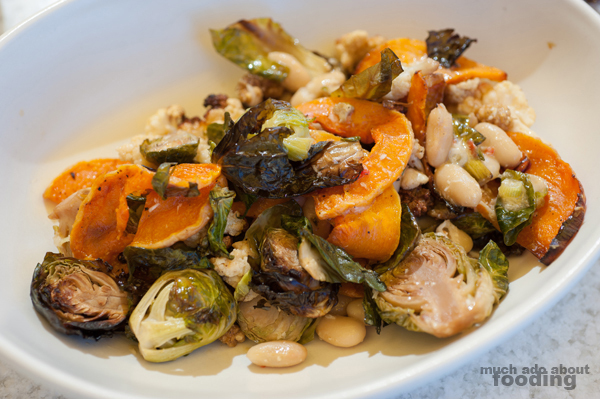 Next we opted for their Autumn Ingredient Salad ($13 - brussels sprouts, cauliflower, squash, mulberries, white beans, pomegranate, and horseradish vinaigrette) which wasn't new to True Food Kitchen but has been a returning favorite for the area. Though called a salad, this was definitely a dish that could be served warm for all of its heartiness. The roasted vegetables of course had their own way of winning us over but what made for an interesting play in the flavors were the occasional sweet bursts of pomegranate seeds and the sinus-clearing sting of horseradish. Combine that with the funky texture that semi-dried mulberries brought in and you have yourself a unique salad that covers the bases of hearty, sweet, spicy, and savory. In regards to entrees, there have been a few additions there as well. Our die was cast upon their Sustainable Steelhead ($20 - with cauliflower stir fry, gai lan, Shiitake mushrooms, chili, and tamari) and Butternut Squash Pizza ($13 - walnut, smoked Mozzarella, sweet onion, and arugula), mostly out of curiosity. 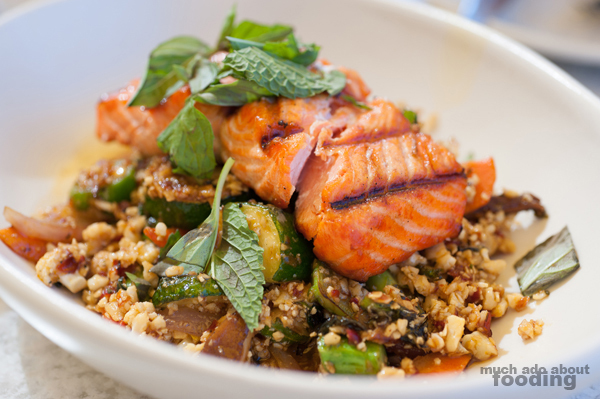 Salmon atop an Asian-inspired stir fry? 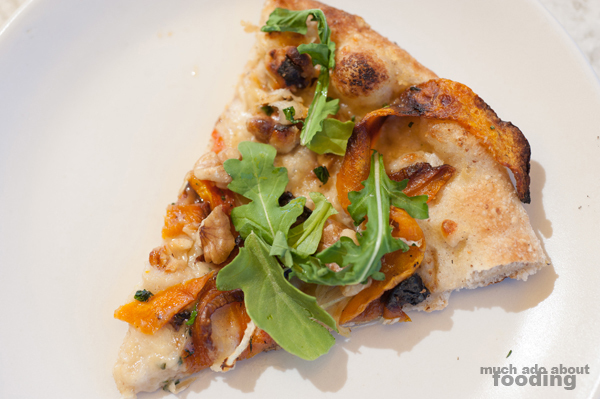 Butternut squash on a pizza? When they both arrived, we could visualize better how all of the pieces fit together. 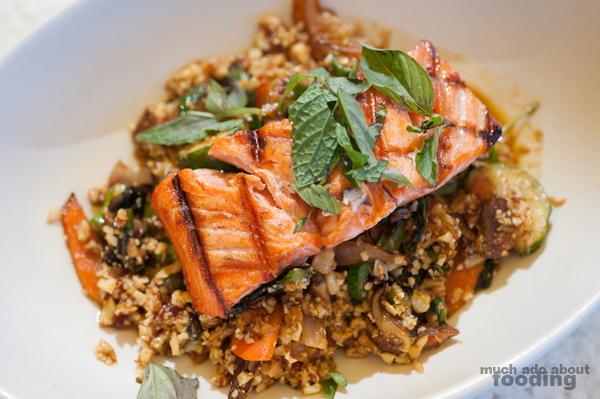 The salmon was meaty enough to withstand the strong flavors of the spicy stir fry which included a generous amount of vegetables and basil. We really enjoyed the base of this dish, particularly because of how the cauliflower had been pulsed until resembling rice. As for the pizza, it managed to work out very well despite the squash not being a typical pizza topping. 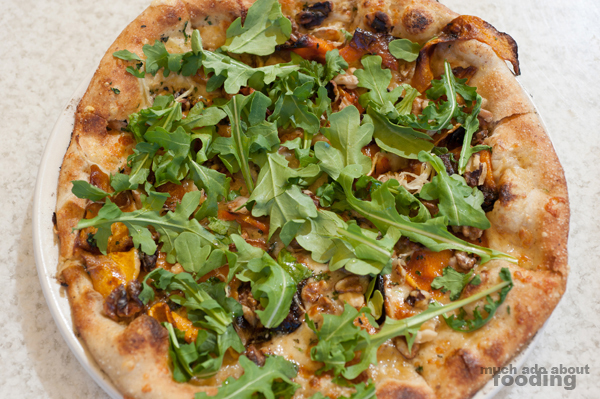 Because of the other ingredients such as smoked Mozzarella and arugula, the pizza was a balance between savory and roasted-sweet. 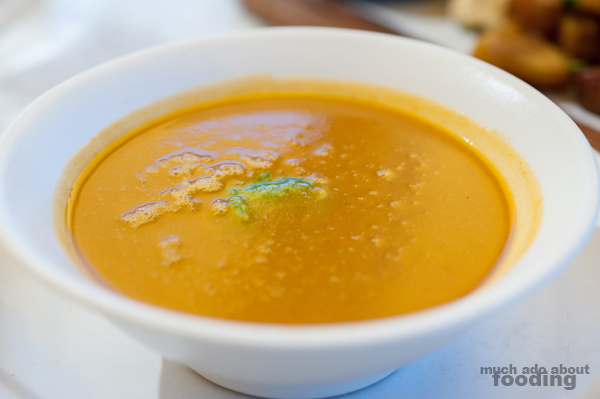 It had a bright feel to it from the fresh vegetables but rounded out with a lovely heartiness from the nuts and squash. To end the meal, we said yes to a Squash Pie which came out as uneventfully as any pie of this sort whether it be pumpkin, sweet potato, or squash. However, don't be fooled because it certainly packs a lot of flavor. Ending out the meal with another way to use squash was perfect too because we had had it in every meal, as is the norm for a seasonal menu. 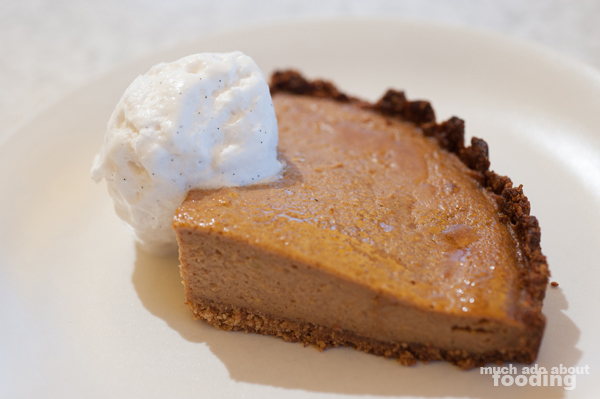 With the right amount of sweet and autumn spice, the slice was a fitting last bite. If you want to try out their fall menu, they have their selections for brunch, lunch, and dinner available; visit True Food Kitchen at 451 Newport Center Drive, Newport Beach, CA 92660. Curious about what changes have come? They now have Tiki cocktails on every menu and new cocktails the Vegan Piña Colada, Spiced Cranberry Sidecar, and Fig & Pomegranate Mule. There is also their Braised Bison Short Rib and desserts of Cranberry Frangipane Cake and Spiced Apple and Goji Berry Crisp. Get ahold of them before the winter menu releases in mid-December!